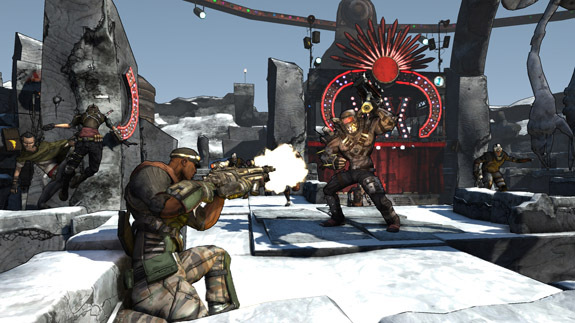 The recently announced Borderlands DLC called Mad Moxxi's Underdome Riot just got a whole lot more interesting, thanks to a recent quote from the content's designer, we know it's quite a bit more substantial than the arena quests we saw in the main game. "This is totally different...basically the idea is that we have this character, Moxxi. She's running this underground coliseum tournament arena thing. The best thing you could compare it to is either Horde mode in 'Gears of War 2' or Firefight mode in 'ODST.' But even those don't quite sum it up. The potential sounds interesting, sure. But what exactly does the mode do that makes it so similar, or rather, defines itself to be listed with the two great survival modes of Gears of War 2 and Halo 3: ODST. "It's all about this crazy Moxxi character, and she's running these tournaments. You go in and fight waves and rounds of monsters, and then she starts changing it all up. She throws out what are called 'Moxxi Maxims,' these rules that dramatically change the way the game play. She'll be like, 'Vampire Rule!' which makes it so that the player's health is constantly draining, but every time you get a kill you get a whole bunch of health back. Now all the players are like, 'Holy crap, I have to play amazingly aggressive,' so you have to charge in before you basically bleed out. Another example, she'll go 'Shotgun Challenge,' where all shotguns do bonus damage and all other guns take a penalty." This is an ENTIRELY NEW GAME MODE. Think ODST's "Firefight" or Gears of War's "Horde Mode". It's like Smash TV in coop FPS, but in the Borderlands. I do believe he said the magic words, "Smash TV." In other Borderlands news, the Xbox 360 version of the game has received a title update fixing quite a few bugs and character class tweaks. Here's the official list. - Fixed some formatting issues with the server list screen. - Fixed an issue causing servers to report the incorrect plot mission. The update should find it's way to the PS3 and PC shortly as well.